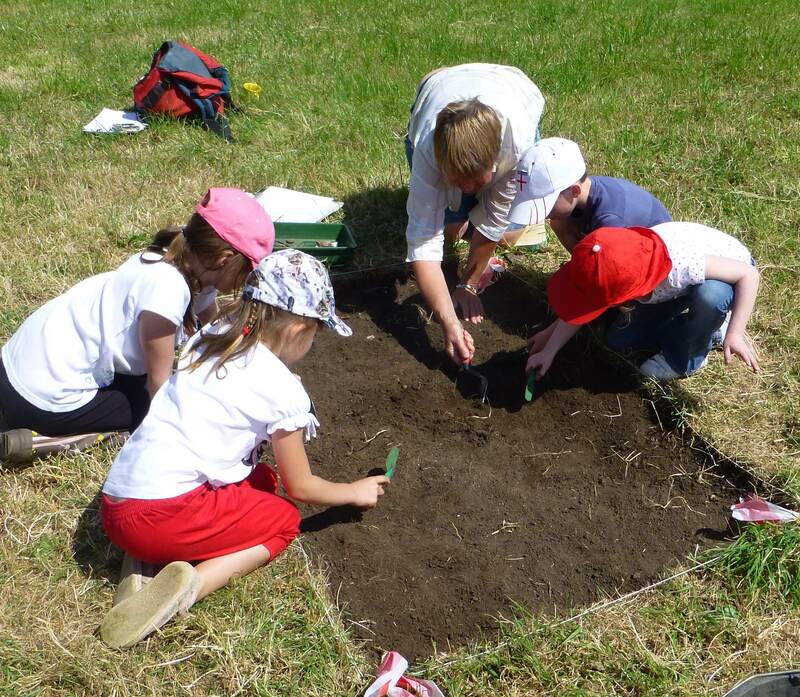 On Wednesday 25th June 2014 the Trendles Project was very pleased to welcome nearly 100 pupils from our local school (Marcham Primary) to a wonderfully sunny, school archaeology open day. Each of the four classes joined us for two-hour sessions in the paddock at Manor Farm. The children were divided into groups and given a coloured sticker to represent their group. Trendles Project volunteer Patsy came up with the ingenious idea of leading ‘cohorts’ of children from one activity to the other with Roman eagle standards in the group colour – all eagerly carried by the children. We found our attempt at Roman military organisation worked very well! Small test pits were opened and the pupils, supervised by Trendles Project volunteers, were able to try their hand at excavating. They soon began discovering a range of finds including medieval and post medieval pottery, animal bone (the remains of ancient meals) and metalwork. The children learnt the importance of sieving the soil from the test pits and how to wash their finds properly so we could identify and photograph them. They were also shown how to record the layers of soil, and a dumpy level (a surveying instrument) was set up to give the children an opportunity to see how we record the location of finds and objects. A range of prehistoric or Roman themed craft activities were also on offer. 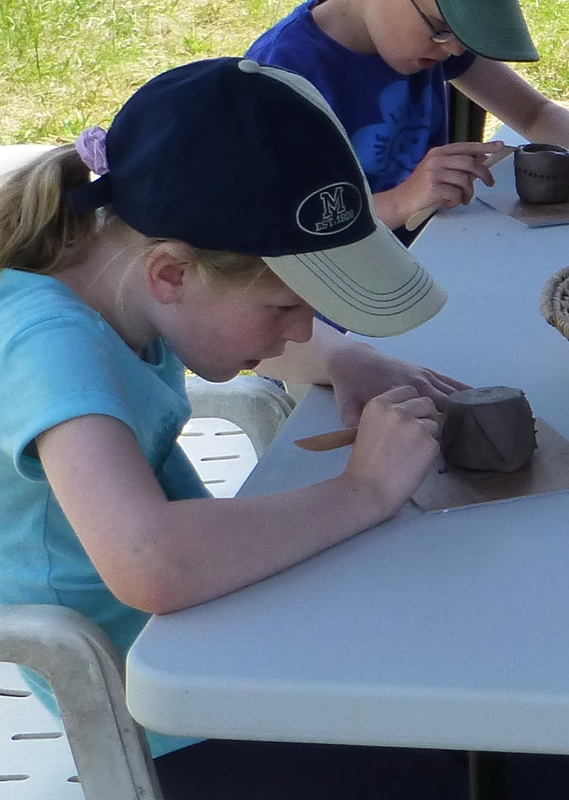 The children were taught to make Iron Age style thumb pots from balls of clay by volunteer Ricky, who is also an amateur potter, which they then decorated with a range of tools similar to those used in prehistoric times. 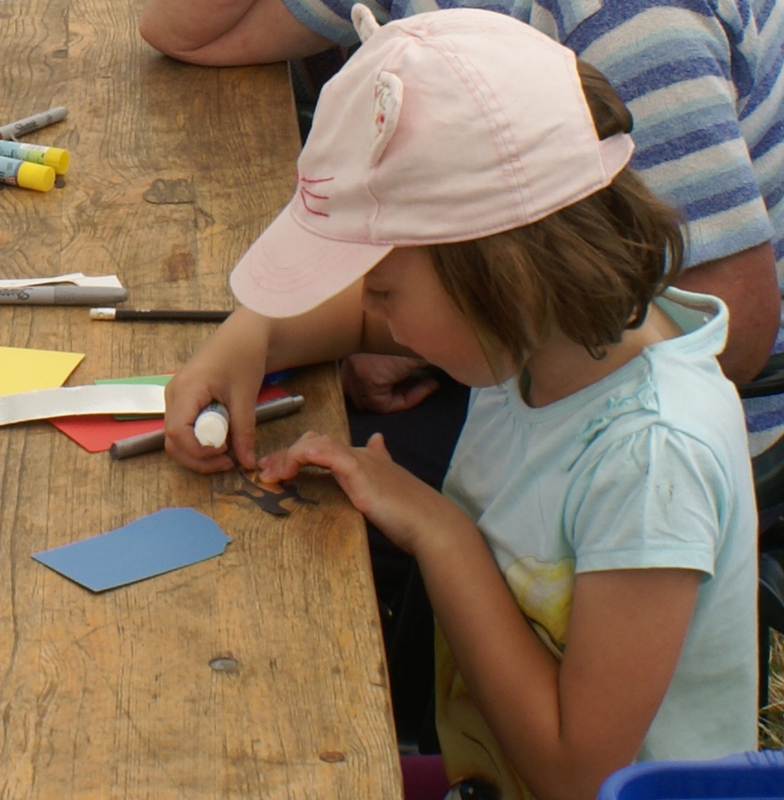 Others spent some time in Emma’s Roman crafts tent, designing a mosaic or making a Roman-style dog brooch from card and metallic pens and left sporting some splendidly decorated brooches! Small altars to Ceres, Mercury and Mars were created to show the children what the Roman visitors would have done on the temple site. The children were given a variety of different types of offerings to see if they could match the correct offering to the god (Ceres, the goddess of crops and fertility had little images of bread and wheat-sheaves to give as offerings). Everyone (teachers included!) 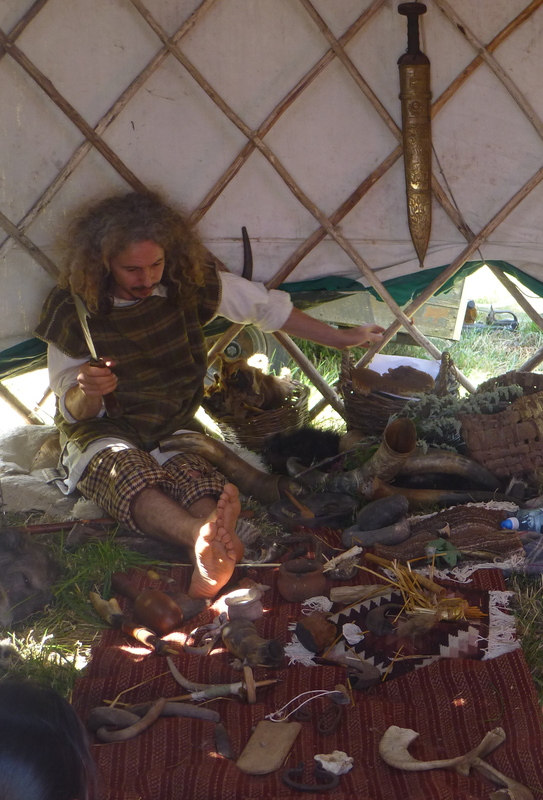 spent time with ‘Celtic Chris’, and learnt about the Iron Age through discussion, music and objects. 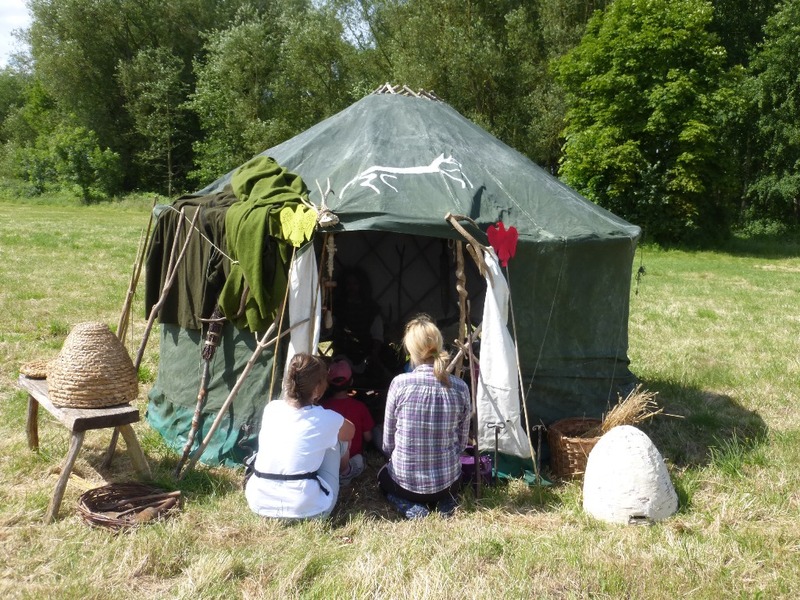 Each child was given a role in their own Iron Age community finding out what their life would have been like. 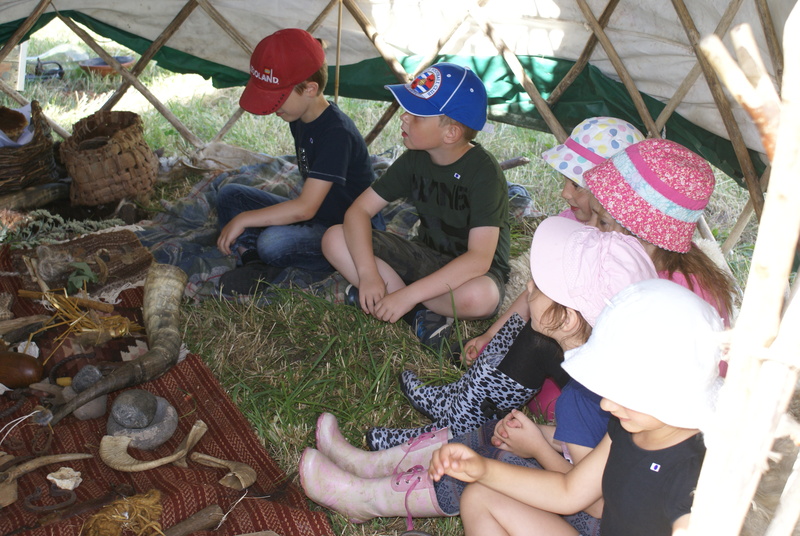 Chris demonstrated prehistoric crafts and showed the children the various tools, equipment, clothes and musical instruments that would have been used in the Iron Age and introduced them to Bear, his prehistoric-type dog! Both Chris and Bear were a smash hit! It seems our young visitors enjoyed the day as much as we did!